Germany is the great place to immigrate for skilled professionals who wish to work in overseas. With a robust economy and huge employment prospects, Germany has stood as the best place for qualified, skilled professionals. The country stood one amongst the leading destinations on technology, employment and sports. Overseas skilled professionals prefer Germany over other study destinations to take advantage of its great career and better lifestyle options. With more than 500 companies and low unemployment rate, immigration to Germany is the perfect option for skilled professionals. The country is developing at a faster pace in major key sectors, and one can find ample job opportunities after immigrating to Germany. What is Germany EU Blue card? Germany EU Blue Card is a residence permit, which allows you to stay legally in an EU- member state for the purpose of work. Citizens of non-EU nations can apply for the EU Blue card to enter the country. In other words, we can state that the EU Blue card is for skilled professionals of not- EU- States to reside and work in the European Union. Through Germany EU Blue Card, the country can address the shortage of skilled professionals. Holders of Germany EU Blue card will get the same salary as EU citizens who do the same job. Germany EU Blue card is valid for a maximum period of four years, and one can apply for an unlimited residence permit after residing for three years. In case, if the applicant is proficient in German language, then they can apply for an unlimited residence permit after two years. Apart from this family members are also allowed an unrestricted right to work in Germany. 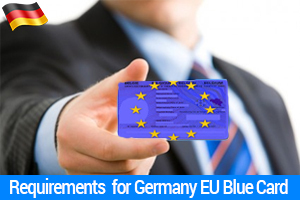 Who Can Apply for Germany EU Blue Card? I did my m.pharmacy with 72%in sv university tirupati.I am planning to do ph.d in Germany.